Only 4 diggers this weekend, must be the rain. Speaking of which, the Millers Cottage must have been very damp and prone to flooding. The internal drain was added post first phase construction but the fireplace is on top of it. 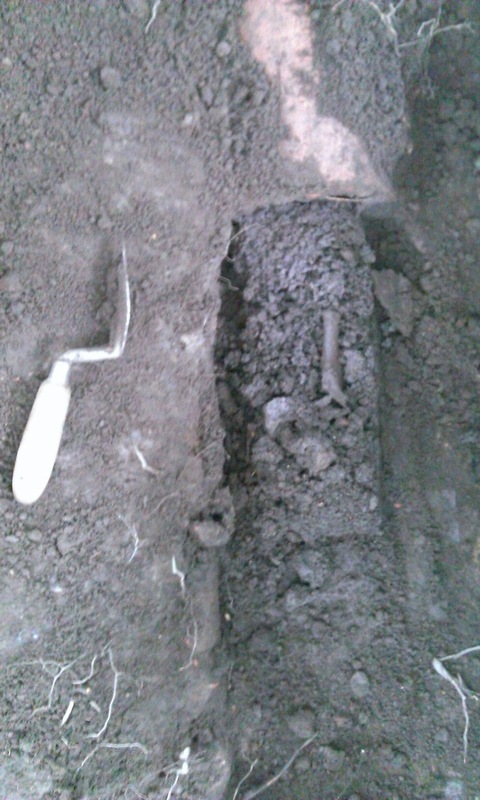 Also found some animal bones in the external French drain including beef rib. Very dark and chilly in the woods, when’s summer? 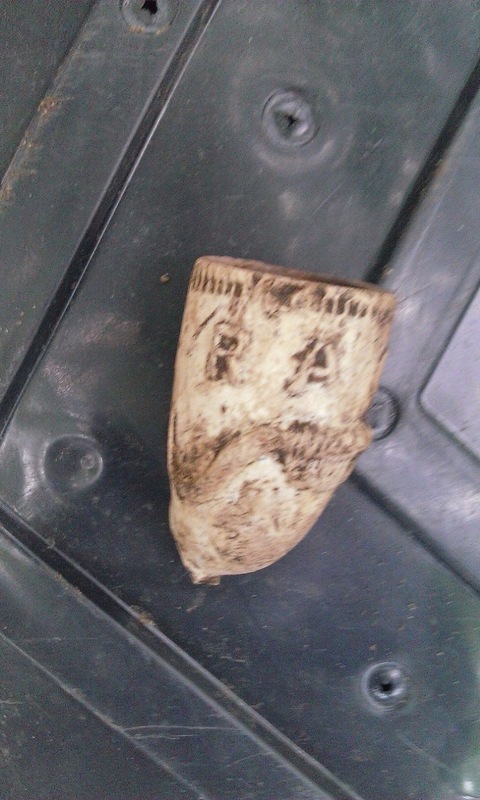 Found a Royal Association of Buffolos clay pipe, late C18/ early C19 today. Saturday 21 June, Sunday 22 June. 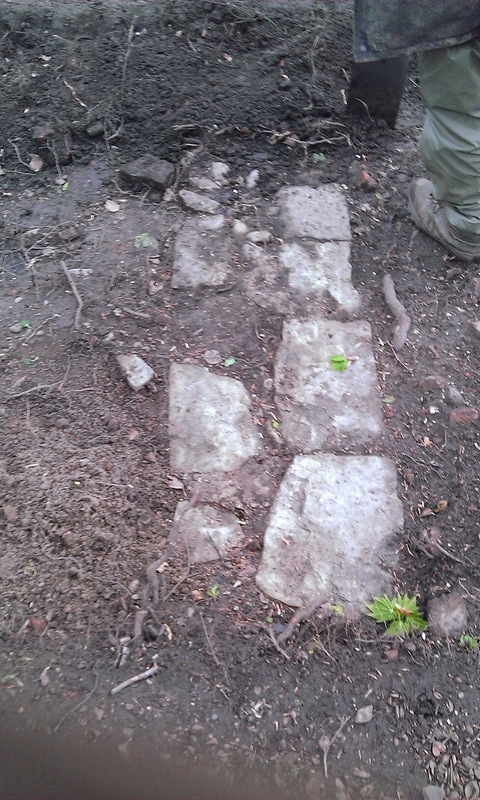 Good news, we found a corner of man made bricks, hopefully lying on the earlier stone wall. 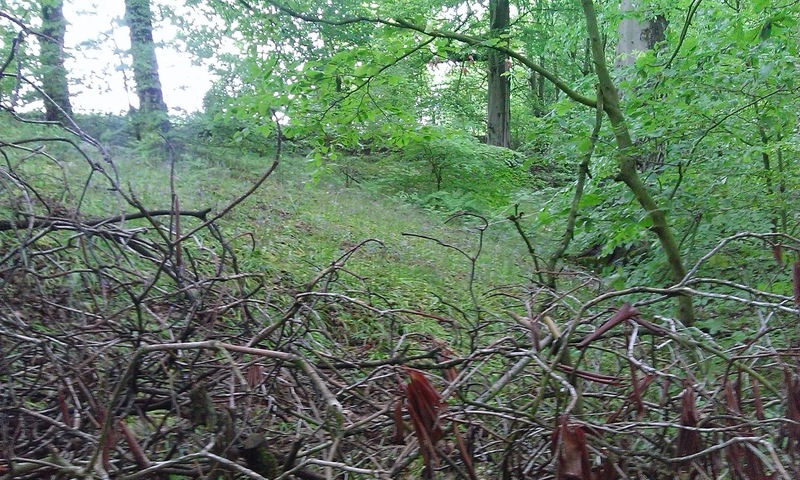 Bad news, the other corner is under our spoil heap! Arrived to find the fairies had visited the dig again and set fire to our tarps. 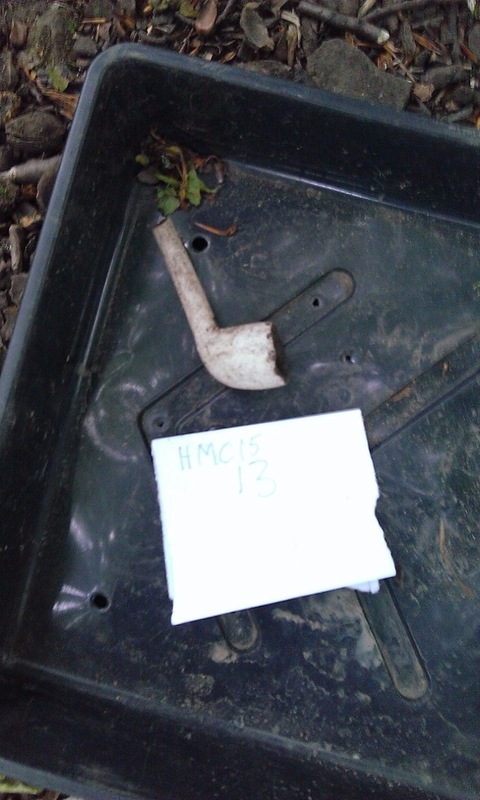 They missed this C19 clay pipe. Flamin June was wet and windy today but 5 of us got stuck in. 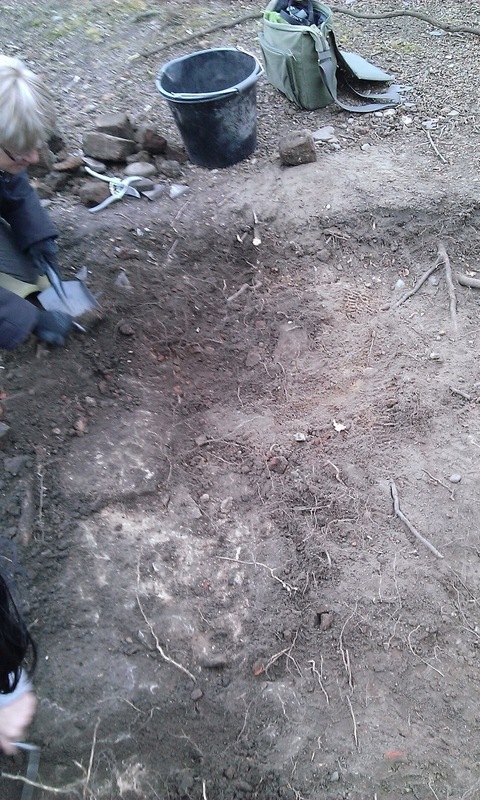 The trench is cleaning up nicely but we are planning to extend to try and find a corner. 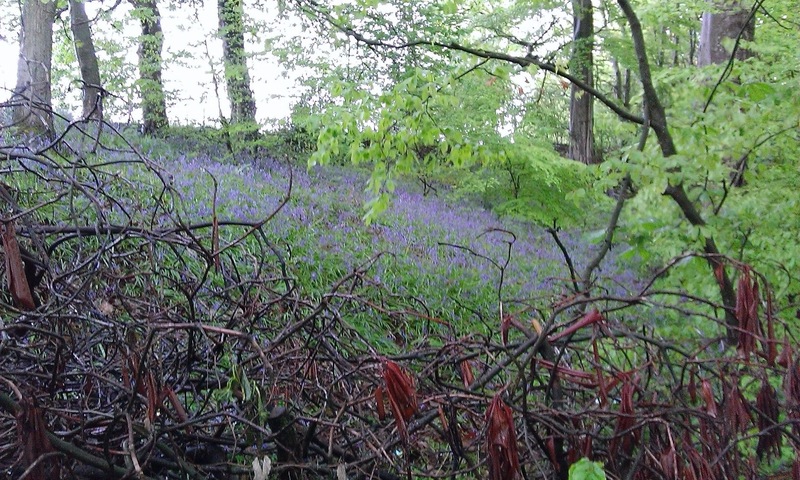 The Bluebells are dying off to be replaced by Hymalayn Balsam, how sad. It feels good to pull them out as you pass. 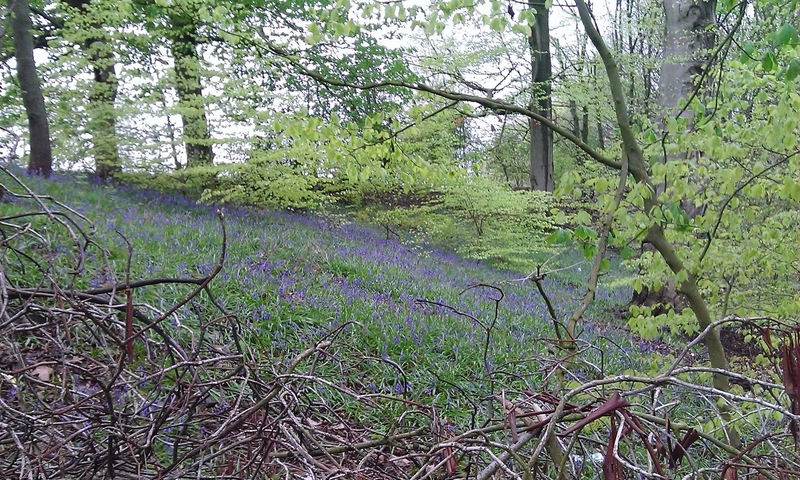 My time lapse of the bluebells over 5 weeks is below. 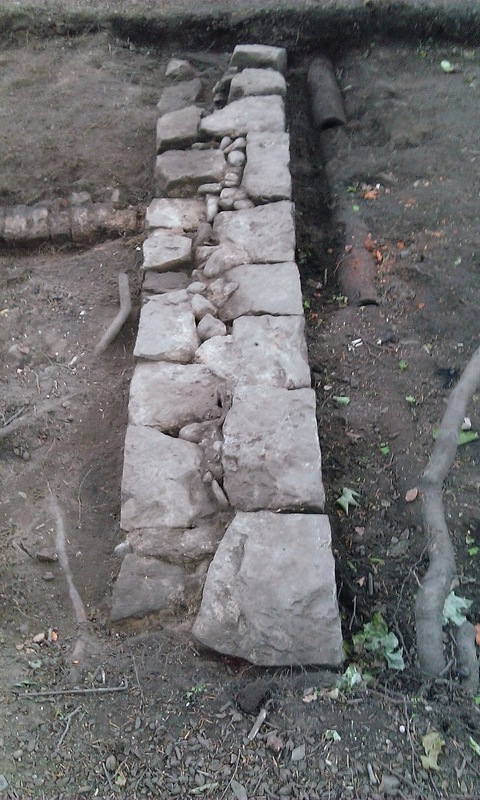 Day 8 confirmed that the two stone walls are external as the both have French drains running outside. These are both later than the stone wall. 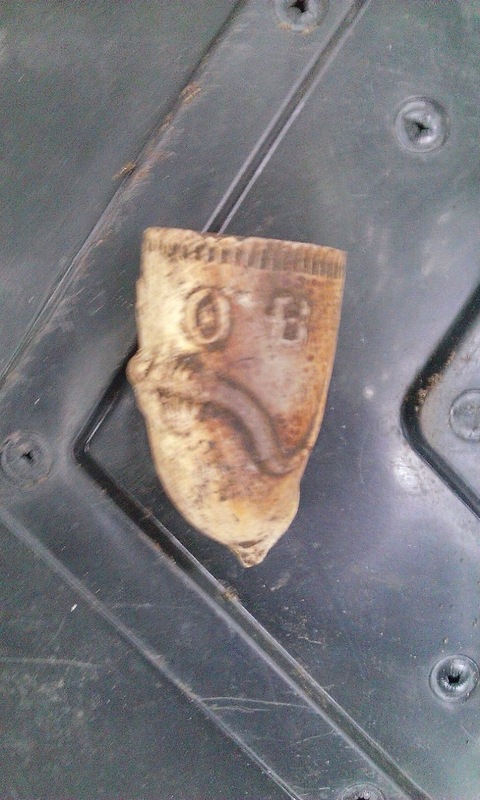 The tree roots are making it difficult work and there a lots of features that need cleaning up. Memory gone on phone so no pics this week. Several new features appeared today as the last of the top soil was removed from area A. 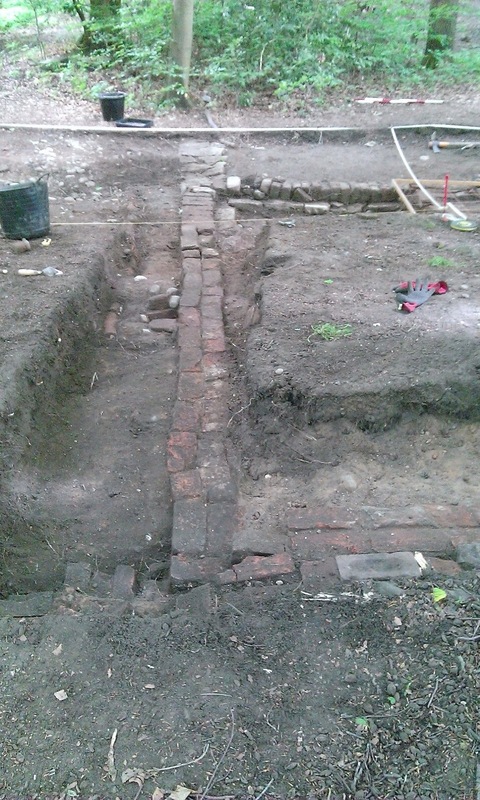 They included the base of a fireplace and a water drain running outside the South wall. 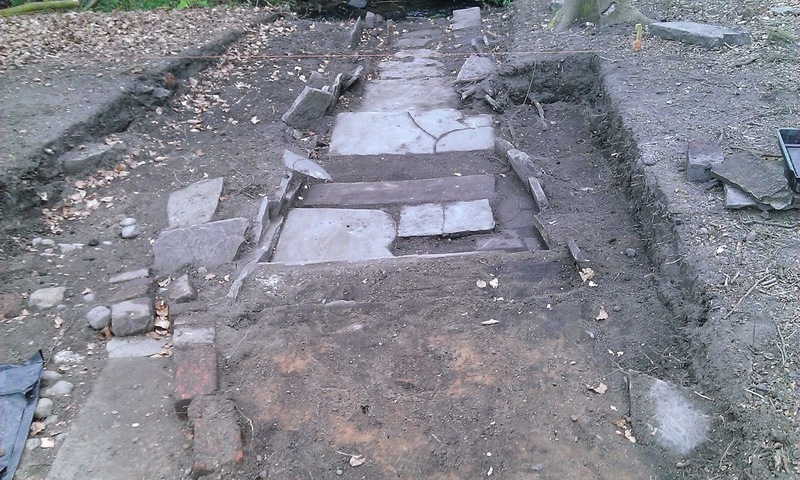 The Garden feature is becoming even more interesting.We are shortly to announce a weekend dig on the site on 21/22 June so working members have no excuses for not turning up. No rain today. 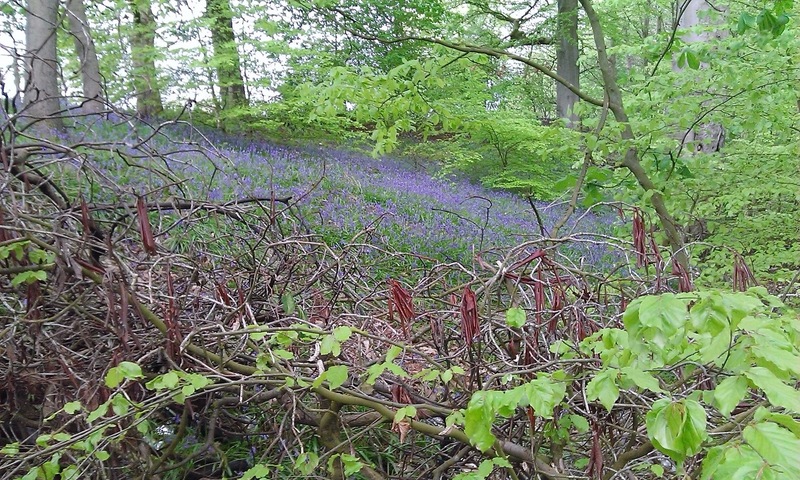 Bluebells are looking even bluer than last week, and there are white bluebells growing in places. We joined Trenches 1&2 today and christened the new creation Area A. 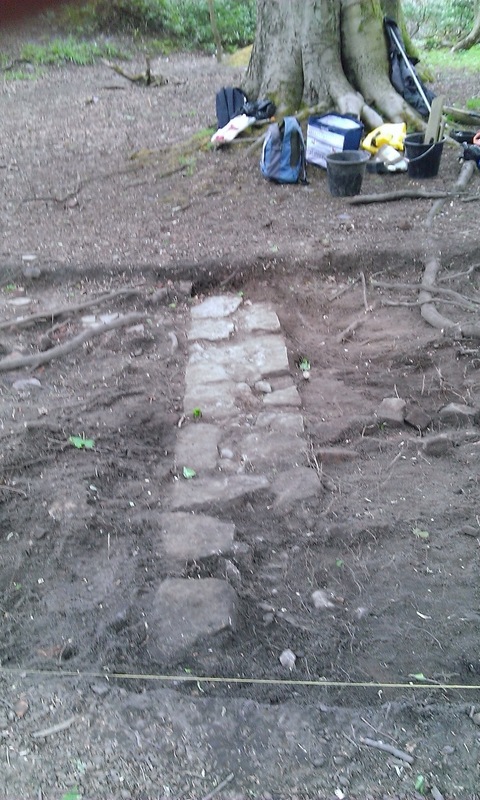 We found a new stone foundation wall at the North of the trench. Day 6 was rather wet at first but brightened up later in the day, 5 MAS members joined in. 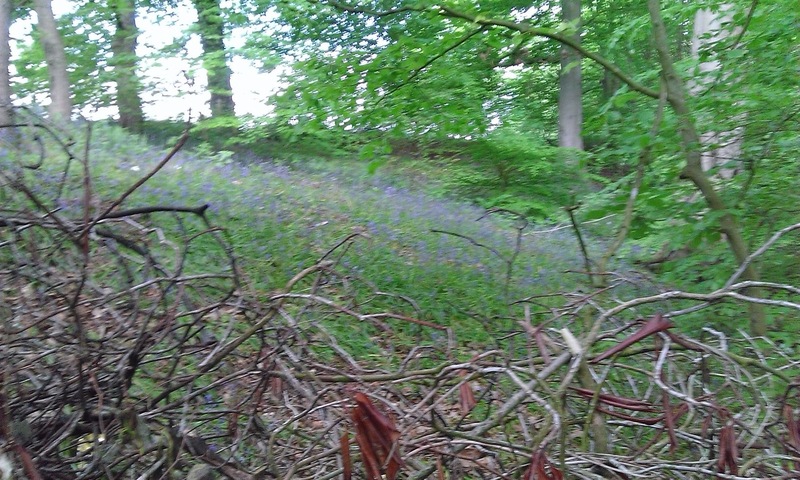 The woods change every time we walk up the lane, today the bluebells were looking rather splendid. Trench 2 was the center of attention with Geoff Wellens finding another foundation wall before dashing off to his next project. The wall is North South orientation of single end on hand made brick. 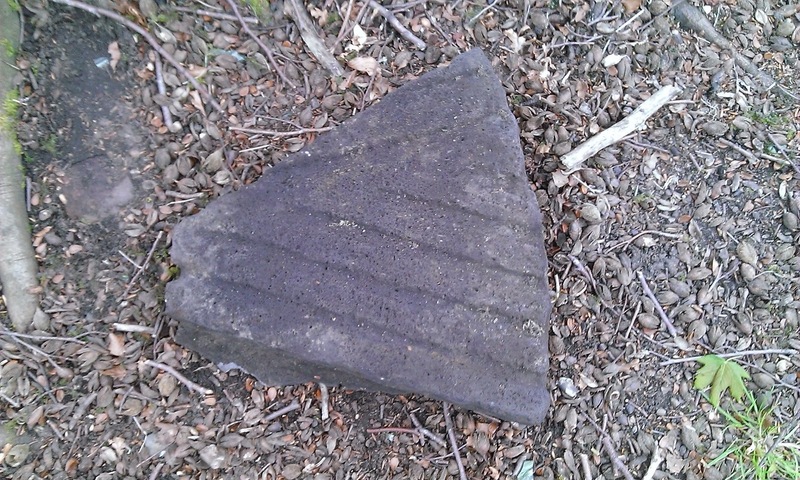 This is not quite perpendicular to the hefty West East stone foundation found last week. 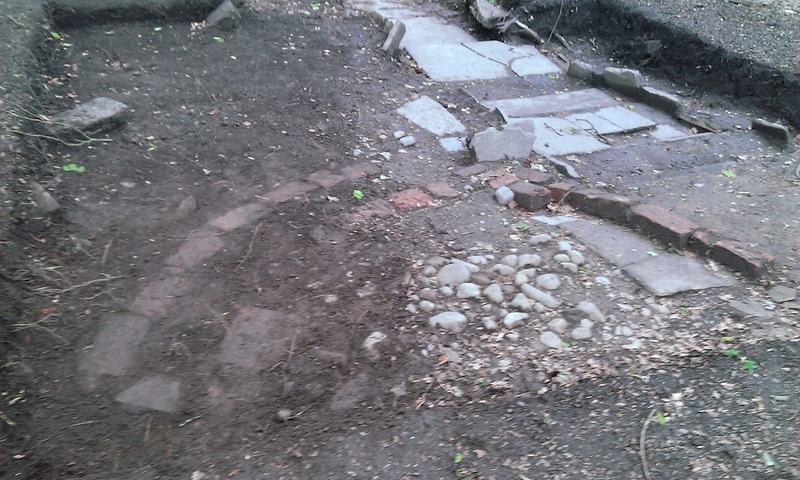 Trench 2 found a non linear feature, a brick circle that appears to be ornamental. Next week we may join the trenches and see where a walk up the garden path leads us. Day five of this fantastic dig saw three merry men and four women brave the four seasons in one day including several hailstorms. 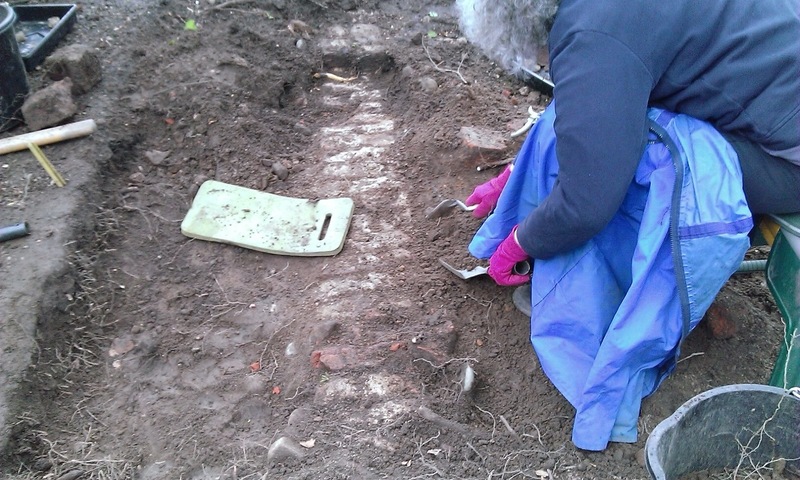 A first timer, Jenny, showed the Trench 2 team how to find a cottage and uncovered a lovely stone wall. 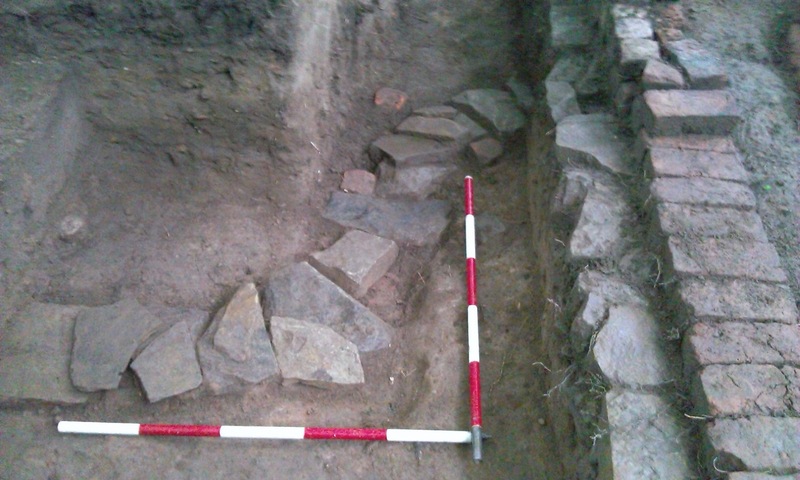 Trench 1 was extended to find the full extent of the pathway to the bridge. 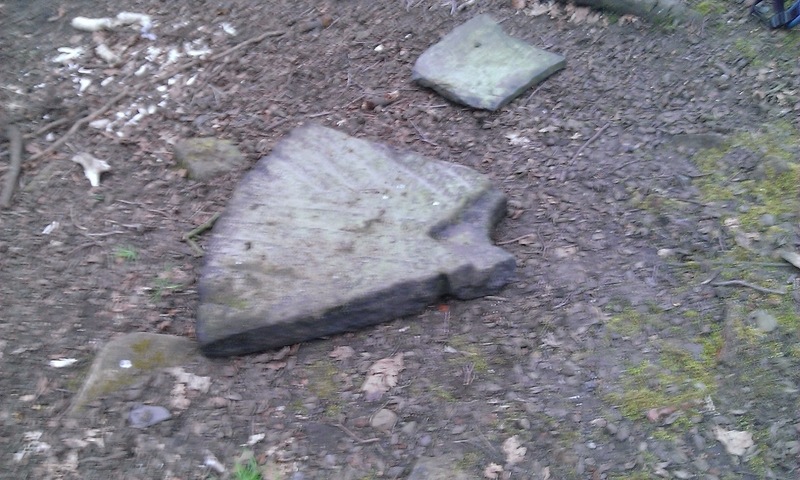 We located another segment of mill stone that appears to be made of volcanic rock. 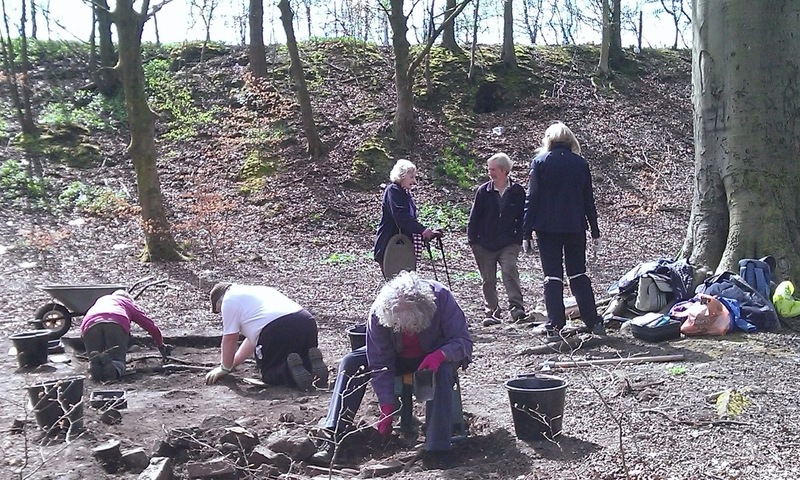 The time team expanded to nine due in part to the wonderful weather or perhaps word has got out on the exciting archaeology we are finding? 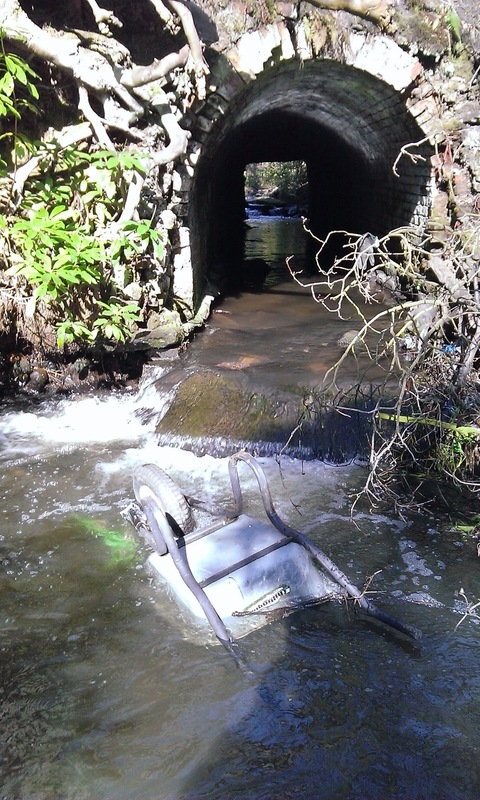 The first job was to recover the wheelbarrow and spades from the river where some kind passer by had put them for safe keeping. 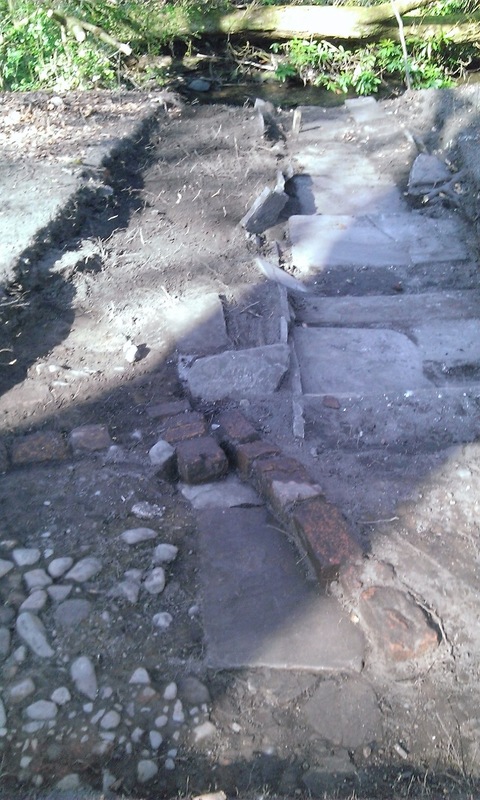 Trench one is showing a substantial pathway and we found a cobbled surface today that was cleaned by our cobble specialist Sonia. 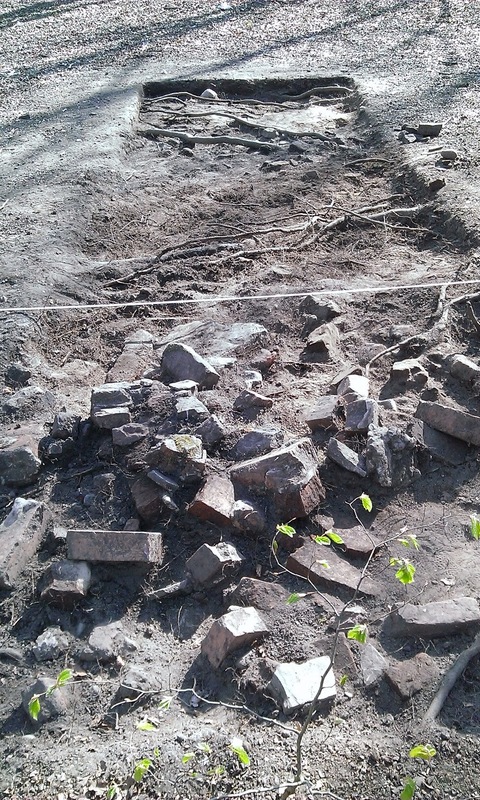 Trench two is a bit of a nightmare with demolition rubble and tree roots. 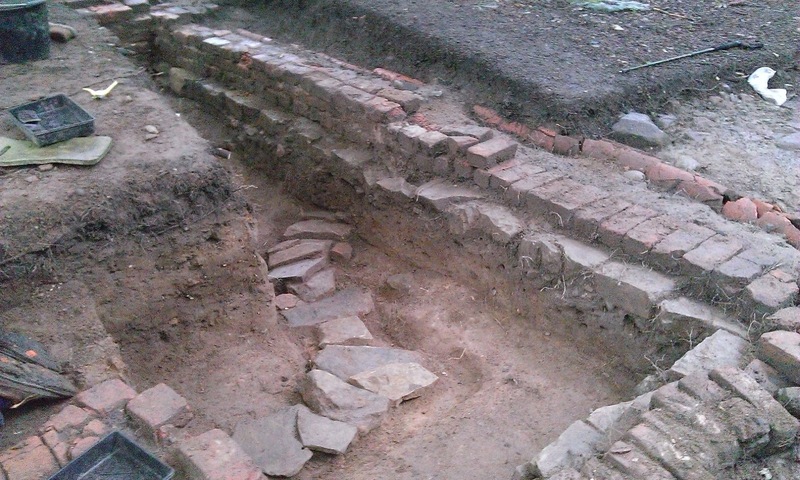 Next Tuesday should reveal some of the cottage walls. The first Tuesday and day three of the Mill Cottage investigation. Seven diggers turned up to enjoy the sunshine, birdsong and babbling of the River Trub. 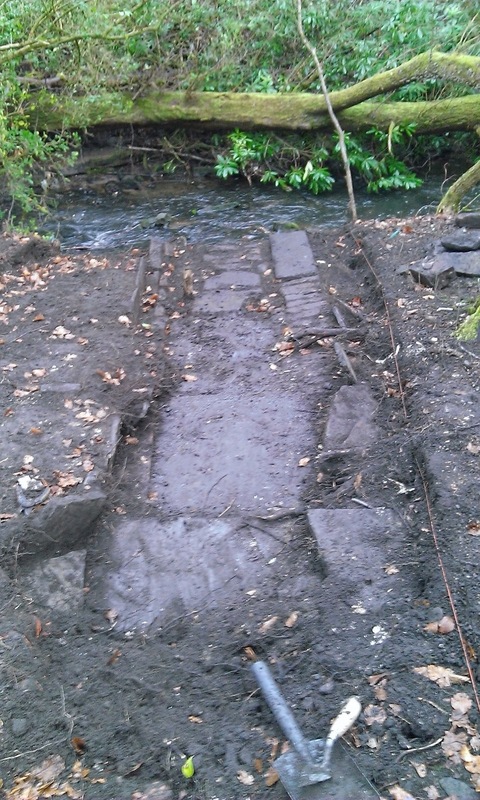 The main ditch is starting to show some surfaces and cuts, we are slowly removing the demolition layers. 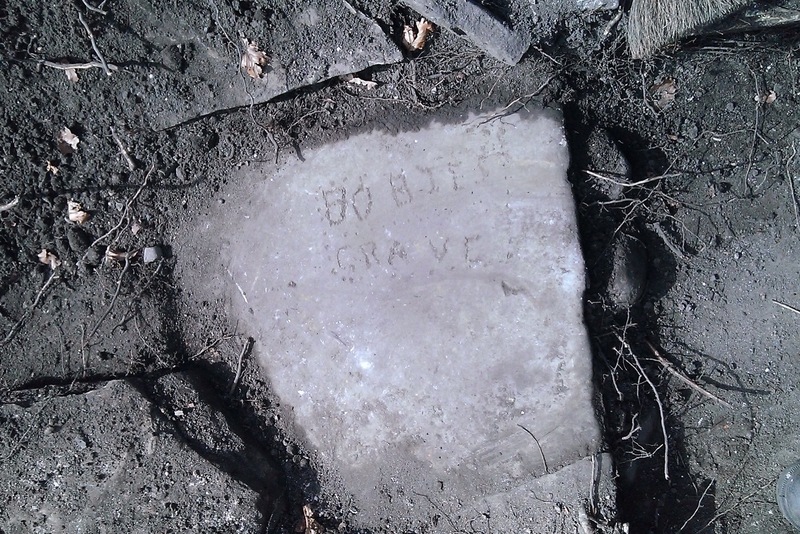 The footpath has turned up a simple carving of “Bobies grave” which may indicate a family pet buried in the garden. We will see if Marian has any recollection. 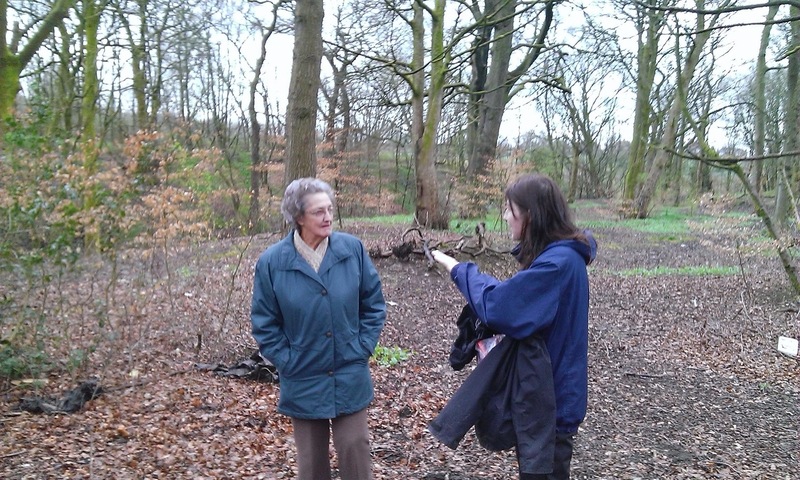 Join us next Tuesday 21 April if you fancy a day in the woods. 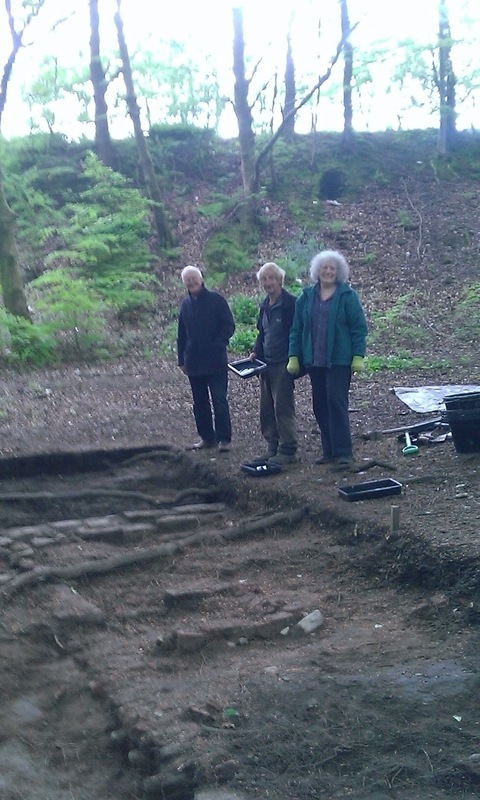 The dig commenced with a visit from Marian who was born in Bothy cottage some 84 years ago. 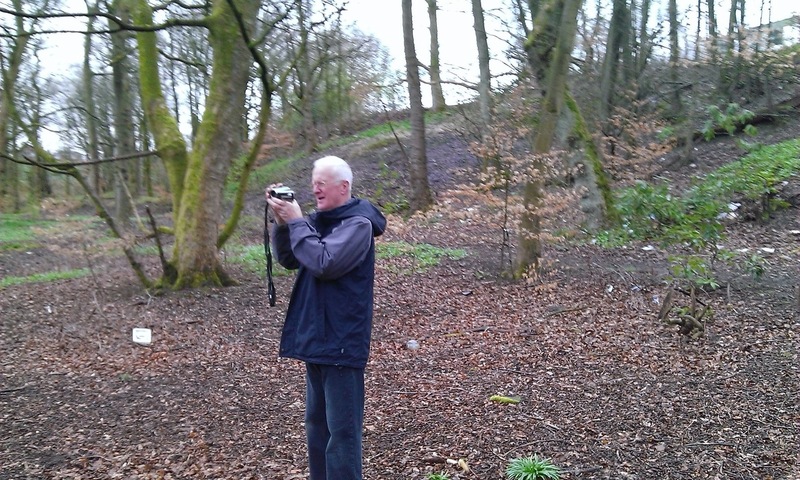 Geoff Wellens recorded her memories of living there with her family. This included crossing the bridge to fetch water from the spring and stories of her fathers pony and cart. She used to collect firewood for the lady who lived in the hall. A reference to a mill house occurs in 1781-2 described as of two bays. 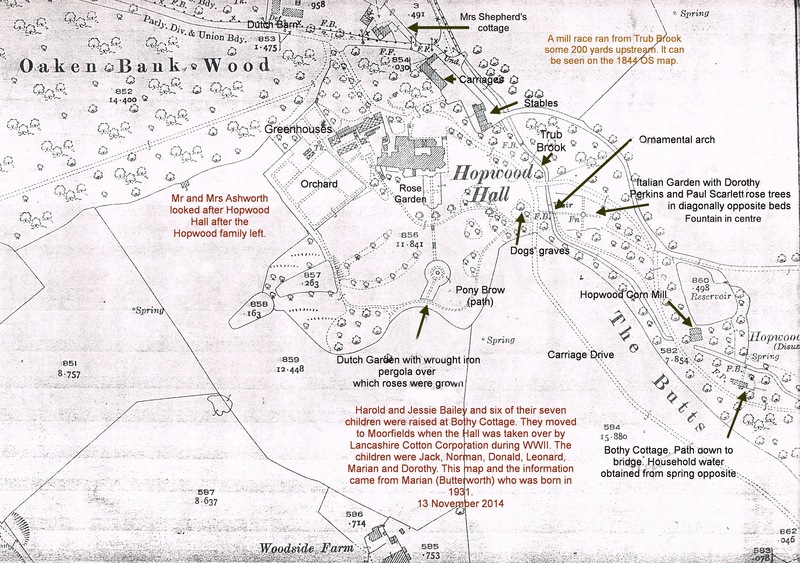 The building appears on the 1840 tithe map as a rectangular narrow structure. 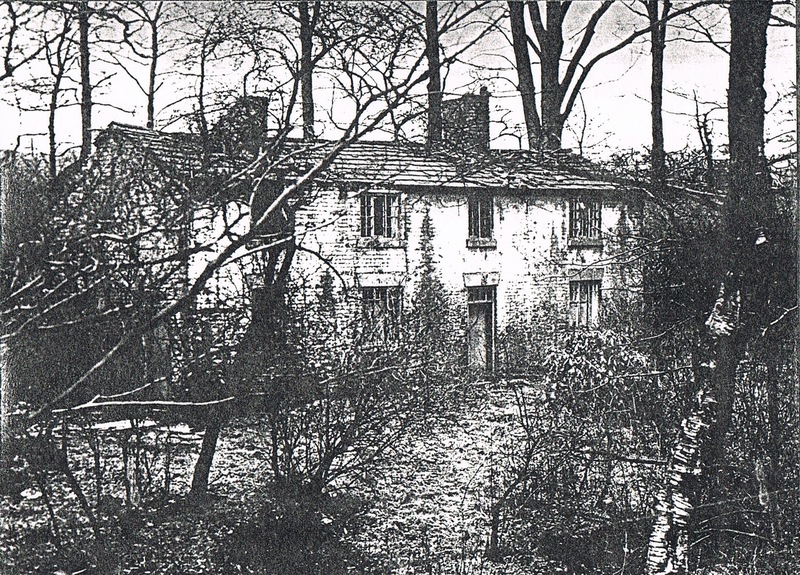 The adjacent corn mill ceased operation in the 1880s but the cottage continued to be used by Hopwood estate workers and their families. Known as Bothy Cottage, It was demolished in the 1940’s.